Watch the video and catch the feeling. Visby Golf Club from above. Our 18-hole course, redesigned by Pierre Fulke and Adam Mednick in 2009, is considered one of the most beautiful in the country. In Golf Digest's latest ranking, we ended up in third place of all courses in Sweden. Our ambition is to deliver a golf experience beyond the ordinary, both on and off the course. Welcome! Even our full length 9-hole course is designed by Pierre Fulke and Adam Mednick. A beautiful and challenging course with large, undulating greens and generous bunkers. The course is open year round, as long as there is no snow and frost on the greens and tees. Guests are welcome to play at anytime! 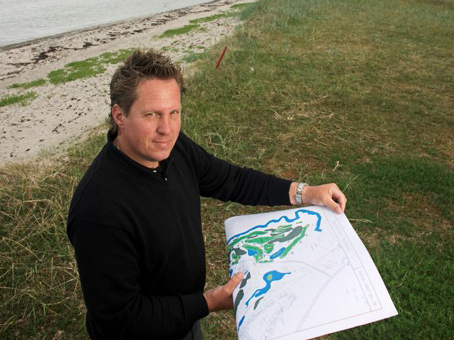 "Few places, or golf courses, attracts me as much as Visby Golf Club and Kronholmen. It is a great privilege for me to transform and manage this historic golf land. I will never forget that day in late 2005, when I and Adam Mednick visited the club for the first time. Northely winds. Three degrees Celsius. But we were literally blown away by the beauty and the course's potential. To quote Mr Douglas Brasier, former course-designer: I would truly say that you have wonderful opportunities to make an excellent golf course at Kronholmen. No one could agree more. The rich flora and birdlife is truly unique. The constant presence of the Baltic Sea, swaying grass and windswept pines create a relaxed atmosphere and a golf experience beyond the ordinary. Hope you enjoy it as much as I do!" It is a pleasure and a great challenge to be responsible for the team that will maintain and develop one of Sweden's best courses. Every day we strive to deliver and set up the ultimate course, based on weather conditions and other circumstances. We work with many small details and draw inspiration and knowledge from the most well-maintained courses in the UK. We simply do our very best to ensure that your experience of Kronholmen and Visby Golf Club will meet your highest expectations.